is important for ongoing pain control, especially if you suffer with long-term or chronic pain. Interventional pain management is a “discipline of medicine devoted to the diagnosis and treatment of pain related disorders.” Interventional pain medicine utilizes a multidisciplinary approach, in which a team of health care professionals works together, to provide a full range of treatments and services for patients suffering from chronic and/or acute pain. 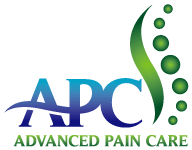 The goals of Advanced Pain Care are to relieve, reduce, or manage pain and improve a patient’s overall quality of life through minimally invasive techniques specifically designed to diagnose and treat painful conditions. Advanced Pain Care also strives to help patients return to their everyday activities quickly and without heavy reliance on medications. To help our patients to understand pain, this website aggregates a lot of pain management related knowledge for you to understand pain symptoms and pain treatment. If you need any help or want to talk us regarding your pain, please call us at 973-379-3688 or send us a message by the following form for a consultation now. Our clinic takes auto injury patient, workerman’s compensation patient, commercial patient and medicare patient.